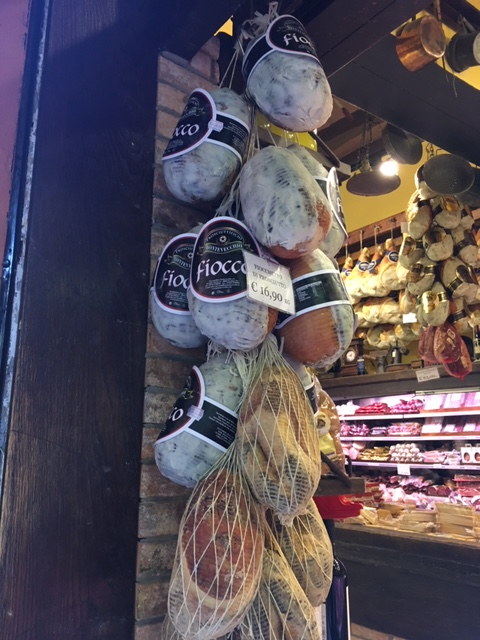 Bologna is not one of the major tourist destinations in Italy, at least not for Americans, which is both a shame (because it's fabulous) and a blessing (because it remains less crowded than Rome, Florence, and Venice and moves at a decidedly slower pace). Many of the guide books skip over it or give it barely a mention and yet my Italian friends love this city and visit often. Add to that the region's reputation as la pancia (the stomach) of Italy with a unique and fabulous cuisine and I had to check it out for myself. And so, with a long weekend to spend, I headed to Bologna with few expectations other than exploring, wandering, and sampling good food. It didn't take long for me to become enamored with this city - the beautiful pale red hues of the buildings and roof tops, the large medieval plazas ringed with architectural masterpieces, the cafe/bars offering perfect seats for watching the action, the bustling markets, those unique and stunning porticos, the churches, the art, and - oh yes, the food. In short, what is there to like about Bologna? Everything! Bologna is just 35 minutes from Florence by train, but don't be tempted to "do" Bologna as a day trip. It is well worth spending several days in this beautiful city, so find a good B&B and settle in to explore. I was delighted with my stay at the B&B Palazzo Trevi on Via Frassinago. This is a warm and friendly place gracefully run by owners Consuela and Francesco. The rooms are comfortable and pretty, the breakfasts bountiful, and the location superb. Ask the owners for restaurant recommendations - they know the best spots in this neighborhood! It's impossible to see everything Bologna has to offer in a few short days. It's best to map out top priorities and then schedule in lots of time for strolling the arcaded streets, sipping a morning cappuccino or an afternoon drink on a pretty piazza, and just watching and wandering. A good starting point is a walk around the historic center, which is full of medieval buildings, towers, and piazzas. A pausa (break) for coffee at Bar Vittorio on Piazza Maggiore provides a view across across the piazza to the Basilica of San Petronio with its incomplete facade (bottom half marble, top half rough brick). Across the way is Palazzo d'Accursio and the clock tower. Built in the 1300s, this building now serves as the town hall. After pausa, it's just a few steps across the piazza into the courtyard of the Palazzo d'Accursio and a few more to visit the interior of the Basilica of San Petronio with its richly decorated side chapels, beautiful stained glass windows, canopied altar with ornate crucifix, and lovely artwork. There is also an interesting meridian line from the 1600s set into the floor, which provides an accurate way of marking the days of the year. There is a 2-euro photography fee in this church - pay the fee and get a colored armband or risk getting scolded for taking photos without one. At the end of the afternoon, a return to Piazza Maggiore is perfect for a glass of wine or an aperol spritz and more people watching. Just around the corner is Piazza Nettuno, with the famous Fountain of Neptune. The fountain is currently being restored and is hidden by scaffolding. It is possible to schedule an appointment to go inside the scaffolding for a peek but this must be arranged ahead of time. Two fascinating buildings enclose this piazza. First is the Palazzo Re Enzo, built in the 1200s. It has a gorgeous central courtyard, impressive stairways, an arcaded upper floor and an interesting history. Courtyard, Palazzo Re Enzo, Bologna. The second is the Bibliotecca Salaborsa, another medieval building, now the main public library and community center. It's worth stepping inside to see the unique architecture and ceiling and to get a sense of the vibrant community feel of this building, which is used by locals of all ages as a place to work, study, read, and meet. The basement houses a timeline showing the uses of the building over it's long history, as well as some Roman ruins. Piazza Maggiore leads right into Via Pescherie, the heart of the Quadrilatero, or old market. The street is narrow, crowded, and filled with salumeria (delis), fruit and vegetable stands, cheese shops, fish stalls, and lots of opportunities to dine on local specialties. The two towers portrayed by Pio Panfili, 1767. Fanning out from Piazza Maggiore at the center, it's easy to spot the two towers that are the symbol of Bologna. Torre degli Asinelli (highest of the two and higher than the more famous leaning tower in Pisa) and the shorter Torre Garisenda, which has a more dramatic lean. The Asinelli's wooden interior steps are currently closed for restoration, scheduled to reopen in summer 2017. The Biblioteca dell'Archiginnasio is just a bit behind the Basilica San Petronio in Piazza Galvani. This building was the first central seat of the University of Bologna, in the 1500s. It housed the study of medicine, law, and arts. The building is set around a central courtyard, has broad staircases to the classrooms on the upper floors, and contains a famous anatomy classroom. The family crests of students, with names and countries of origin, line the walls. With a building this imposing, the students were bound to take their studies seriously. If only the university where I taught for many years were this beautiful! Osteria Santa Caterina is known for it's salumi platters. Osteria Santa Caterina is a bit out of the center in the area around the Porta Saragozza, located near, and recommended by, the innkeepers at B&B Palazzo Trevi. This is a small, cozy neighborhood place with outstanding food and wine. They have a variety of salumi platters, delicious soups, tortellini in a rich brodo (broth), terrific lasagna, and the absolute best eggplant parmesan I have ever tasted. A morning cappuccino and a torta di mele (apple tart) at Pasticceria Gamberini. Pasticceria Gamberini sits under a portico on Via Ugo Bassi and has lovely pastries and cakes. It's a pleasant place to have a morning coffee and a pezzo dolce (sweet pastry). They have a beautiful array of pastries, cannoli, miniature tarts and sweets, and bite-size savories. They also have takeout panini and tremezzini (those triangular sandwiches) to go - perfect for a picnic lunch. A local Lambrusco wine at Ristorante "da Nello"
Ristorante "da Nello" is just off Piazza Nettuno, on Via Montegrappa. The food here is traditional, including pastas, fish, and meats. The flavors are authentic and delicious, the menu varied, the wine list good, and the waiters friendly. On a warm night, the outside dining area is delightful.